It’s no secret that I met one of my Typosphere heroes earlier this week. And although I travelled down to Canberra with the specific intention of visiting Robert’s exhibition, I feel I should blog about the man that was at the core of the exhibition first. I’ve met many passionate men in my life, and they have always inspired me. Robert is certainly one such man. Through groups on the internet, I have met with over 300 people. I’ve met many interesting and unique characters over the years, and while many of them are forgettable, Rob certainly isn’t. But as always, let me tell you a tale. I settled down to the ‘Blicked’ IBM selectric at Robert’s exhibition when it dawned on me – that I could give this visit a little bit of online life. Why not use this unique machine to write a typecast? Why not make this typecast instant – like a live typecasting on Facebook. I started to tap at the keys and surprised myself by how quickly I could manage to find my way around this modified keyboard. Within a minute I was lifting my eyes from the keyboard and touch typing on a truly foreign setup. I had arrived at the exhibition not having been able to reach Robert via facebook or his blog to organise to meet up, but I wasn’t too despondent about this, and I had accepted by this stage that I may not get to meet him on this occasion – so I decided that while I was at the keyboard I would tap out a letter to Rob, and hope he would be surprised to find it sitting on the table if he swung by. A moment after I had wrote it, I pasted it up on Facebook, and tagged Robert in one of the photos. 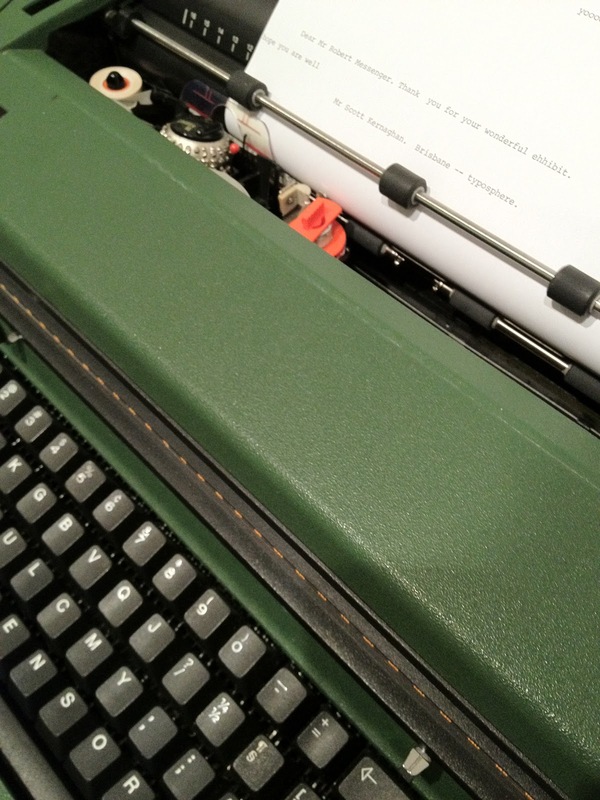 I shifted seats to another machine, an Olivetti 32, and decided to write to the typosphere. In moments I had a posting ready to go – and subsequently uploaded it live onto Facebook. I returned to the IBM and settled into mastering its keyboard. Note the keyboard. Yes… Notice it? There was a creek of a door opening behind me. I spun around to find an attractive, well dressed lady slipping through it with an anxious smile. She looked me in the eye as I peeked at her over my shoulder, and after a moment passed, asked me “Are you, um. Scott Kernaghan”? This was rather unexpected. I knew right away what had happened – Rob had seen my posting on the Antique Typewriter group, and called her up. “Yes” I answered. “Rob saw your post on Facebook and has asked if you could hang about for a bit. He’d really like to meet you”. I could barely get any words out. “R…Really” I stammered, rather surprised but excited about this turn of events. “Yes! And he says he has something for you”. The lady scrolled through her iPhone’s contacts looking for Rob’s number, but had to return upstairs to call Rob back – as she didn’t have his number in her phone. Before long, Rob was strutting through the doors of the exhibit, with a case in his hand. There were other people in the room, and I think Rob thought that the gentleman that was now at the IBM’s keyboard was me. It wasn’t and he seemed very surprised when I called across the room with an excited smile ‘Robert’! Rob and I talked, and before long he had me tapping away on the Bijou that he’d brought me. I was so excited… the machine was amazing, and I was so grateful that he’d given this to me. A few photos were taken, and Robert made a comment about my typing that actually took me by surprise. “Well, you can touch type”! It turns out Robert doesn’t, which had me momentarily stunned. Stunned because he was a collector of typewriters, not because he was a Journalist. Almost all of the Journalists I have ever met have been two-finger typists – I think it comes with the territory. I told Robert that I’ve been using Typewriters since I was 5. I had seen a fleet of them coming through our house as my Grandfather used to be a call-out typewriter mechanic for Adler – which repaired every brand of typer. Rob and I took off to a near-by cafe to have lunch. We talked typewriters, phones, family, journalism and…. well… I checked out the Canberra fashion. It wasn’t bad. Rob was charming and knowledgable. I loved sharing my limited stories with him, and learned a lot from Rob as he talked about some of the other people he’s met along the way with his typewriters. Rob suggested that I could come over to his place and have a look at some of his collection. I eagerly jumped at the chance, as I had been hoping to have an opportunity to have a look at some of the other machines that Rob had featured online. Robert had been transferring his collection from his paid storage sheds to his home, and he explained that he felt a little awkward about letting me have a look while the collection was in such disarray. He shouldn’t have worried. I loved it. 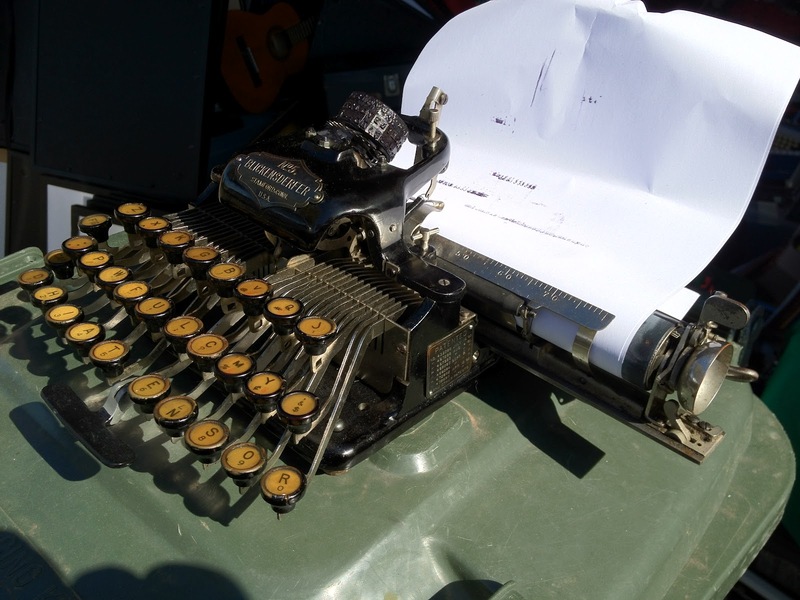 We returned to Robert’s car – a Mitsubishi wagon that was filled with machines he was transferring, along with machines he’d used to demonstrate typewriters at a primary school earlier that day. Robert re-arranged some machines to give me some space to sit, and while doing so grabbed a 2012 Scattori (not sure if that is the correct spelling) and placed it on the roof of his car for me to try. I had expected the Royal to be rubbish – but I was surprised by how nicely it typed. I tapped out a couple of lines, and found it a very competent machine – with the exception of the cheap plastic keys that I doubt will go the distance. For a typewriter less than a year old though, I was pretty surprised. Again Robert was surprised to see me touch typing – this time on a machine on the roof of his car, with the keyboard sitting at about chin height. I wasn’t showing off…. I swear! Robert’s 1000+ strong collection left me speechless. If there was ever and Aladdin’s cave of the typosphere, this was it. One of the machines I wanted so desperately to see – was Robert’s red Royal QDL. I had never seen one in person, and was really hoping to lay my eyes on it. But soon I didn’t care. I eventually did see it, but I only looked at it briefly, as there were so many other AMAZING machines grabbing my attention. There was so much I had never seen before. Rob took me through a few of his typewriters in his lounge. But I just was lost for words. So many cool things to see – so little time. Outside of his garage again, Robert grabbed a Blick out of his car, and placed it on wheelie bin. While Robert shuffled about looking for something, I gave the Blick a good go. And I have to say…. I think I want one. It extraordinarily well made and responsive. I felt confident about writing with it, and I started to see why Robert loved it so much. It was an amazing machine. How cool is this thing! I mean…. How cool is this thing!!!!! Robert kept insisting that if I see a machine I like, I should take it. I saw a lot of machines I liked, but I didn’t feel filling the plane was a good idea. And besides – I had too many machines as it was. I explained this to Robert, and when I told him how many he just laughed. It did seem pretty ridiculous, saying that I had too many while we were standing in an ocean of typewriters. But then I set my eyes on a beautiful Chrome Royal portable. Yes…. Shiny things attract me – I’m shallow like that. ‘WOW’! I exclaimed, and moments later Robert had it sitting on top of another wheelie bin, while he demonstrated some of the problems that the machine had. A Robertus Messengerius in its natural habitat – the improvised typewriter bench. Rob knows his stuff. He really does. And it was absolutely awesome to meet him, and I really hope that I can chat to him again soon, if not visit again. I felt awkward about taking two of his typewriters – even if the Chrome Royal is in such a poor state of operation, and he gave it to me with the promise if getting it working. But Robert seemed more than happy to hand these machines over to me, and I was too excited by them to say no. But I knew that two would be my limit for the plane. On the way to the plane. Getting the machines on the plane is another, rather entertaining story, and worth the effort as I now have both machines sitting at my feet, at the foot of the 1920’s dining room table that I use as a desk. Meeting Rob made the whole trip worth while. Not for the free typewriters, that I am sure that one day I will repay him somehow for these – but because it was really worth the time meeting him, along with seeing his exhibit. 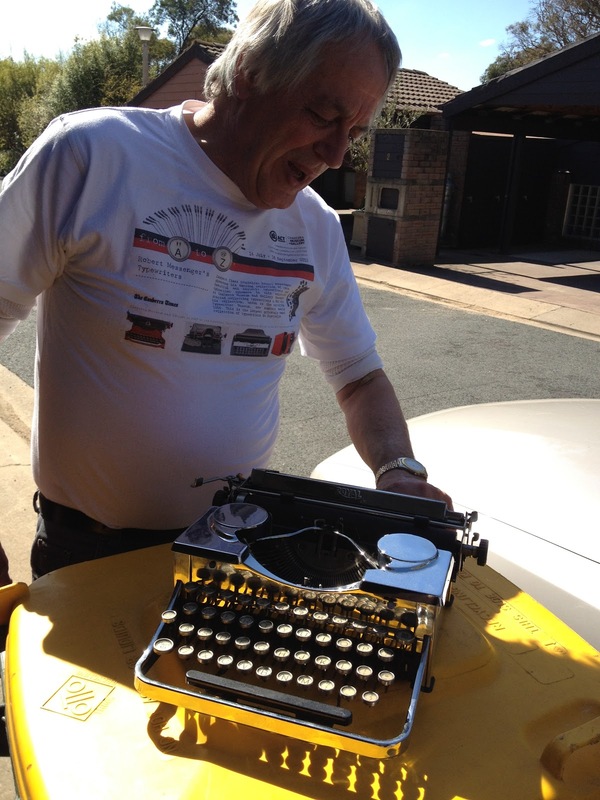 He’s a gentleman, and a walking – talking encyclopaedia of typewriters. And and an amazing and passionate collector. I only realised afterwards that Rob’s blog barely touches on the passion Rob has for these machines, which in their own unique way – have made Robert a collector of fine works of art. And I know he appreciates every piece of art he owns. September 13, 2012 in Bijou, Exhibit, Robert Messenger., royal, talking., typewriter, visit. Hee, it's fun to see the different things you two pointed our in each of your posts. Congrats on the wonderful gifts! That chrome Royal is really a sight to behold; makes me want to find one (or strip one down and chrome it) and figure out a way to mount a lexan display case on my motorcycle for it, because it looks like it belongs on a bike! That was a truly awesome and enjoyable blog post right there. Thank you for sharing and thank goodness you have a talent for storytelling. I wish I could have been there. Two of my favorite typewriter bloggers together, it would have been fun. Your blog is actually one of the first I started reading and was the one that inspired me to create my own, so thank you for that. 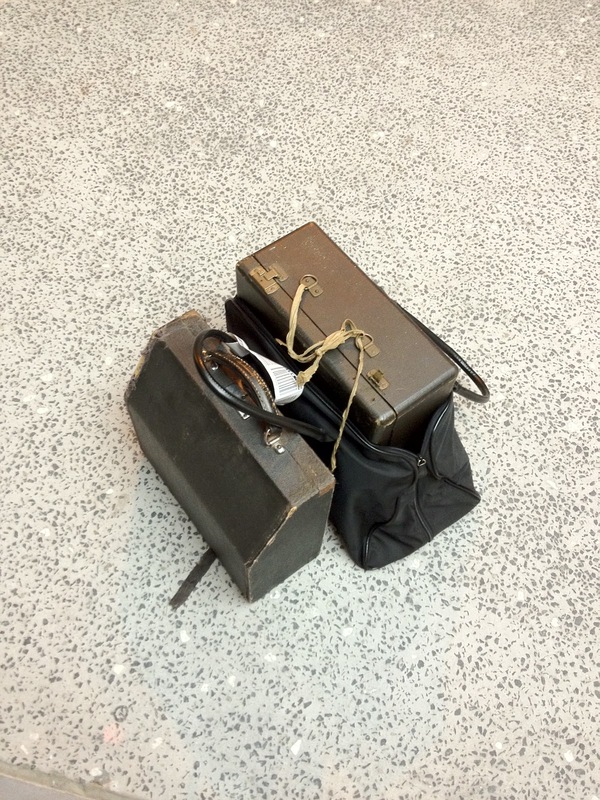 I'm glad you had a great trip and got two really cool typewriters. I want a Blick now too. The Typosphere always comes even more alive whenever its participants meet each other in person. Sounds like a delightful encounter for both concerned. I can touch type myself, but to learn that you started memorizing the DHIATENSOR keyboard in a minute — now THAT's impressive! Thanks Cameron! Which reminds me, I need to get back behind my typewriter and posting letters again. The Royal is a beauty that conceals a beast. I feel I am up to the challenge – but it is going to take some significant work. And speaking of motorcycles… Stay tuned, as I intend a motorcycle related post really soon. Mark, I like to think I can tell a good story, but I am a little verbose sometimes. Sometime in the future, I'd love to be able to get together with a whole group of typospherians. International – or just national – type-in! Robert's account of this meetup was a nice read, as was yours. It is always great to hear both sides of a story that interests you. What a nice exchange the two of you must have had. I drone on and on to Leila about typewriters, but it must be great to have someone that talks back. Ha. That's understandable. I think it is the kind of thing that most people would believe that we are insane to still have a love of. It indeed is nice to find someone with the same kind of passion.